12th Jan 2018 - Crikey, it's nearly mid January! From this initial appraisal, Avalon Produce Ltd obtained exclusivity and planted CABARET and STARDANCE on several of their growers farms for trials. Click on: NUVAR for more varietal information. The support by Tesco Technical Manager and Apple Master John Worth for Avalon's commitment to CABARET and STARDANCE is a key factor in the launch of these exciting new varieties. The 4,500 trees of CABARET and 10,000 STARDANCE planted in Kent are exclusive to Avalon Produce and form part of the continued development with Tesco. Michael Joyles of Avalon Produce Limited added "this continues the commitment and work with Tesco to deliver great products to delight the consumer and to bring new products to market. CABARET has been developed over many years of trial work and one that was identified by Tesco Technical Manager and Apple Master John Worth, who has once again overseen the project." John went on to say "CABARET is another fantastic innovation and forms part of our NPD pipeline in collaboration with Avalon Produce Limited and is certainly one to look out for in the future". CABARET was identified to fill a gap in the market, whilst providing the consumer with a fantastic eating fruit". Michael Joyles added - "Avalon's experience with these two varieties to date has been positive and the current plan is to increase plantings to an initial total of around 20k trees of each by 2018. We are confident of their potential success and anticipate further plantings once they are established in the marketplace. The current marketing strategy places CABARET and STARDANCE in Tesco's 'British Dessert' pack category following SPARTAN and MAIRAC® in the seasonal mix. 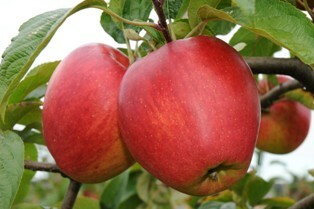 Both CABARET and STARDANCE varieties share the same parents; SATURN X BRAEBURN and were raised by John Breach and his son Peter. John & Peter Breach are delighted a leading marketer and a leading supermarket are supporting these new UK varieties. With 41, 000 acres and 32 million trees, Gala now makes up the most apple acreage in Washington State. Tree fruit and grape growers in Washington have new planning tools when making decisions about what to plant and what to take out. 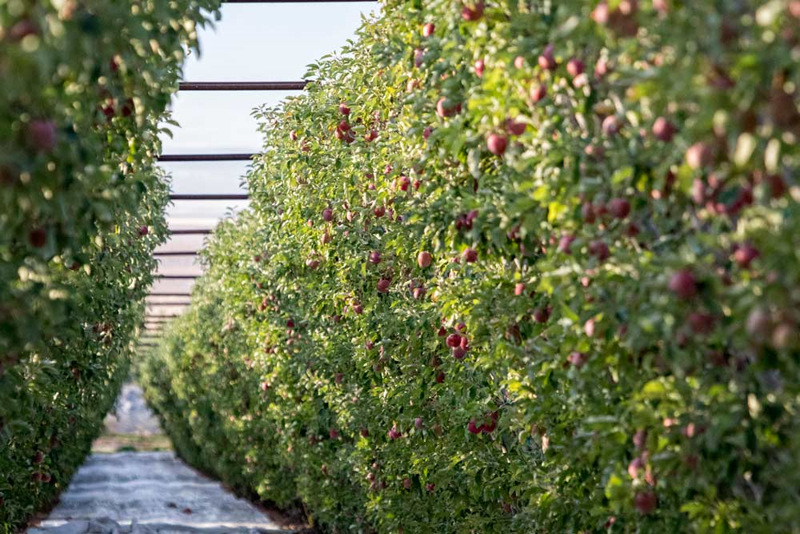 The U.S. Department of Agriculture has released results from grower surveys that provide a glimpse into the shifting varieties, densities and trends of the tree fruit and grape industries. "It helps growers make some educated guesses about what they should be planting," said Jon DeVaney, president of the Washington State Tree Fruit Association. The Yakima-based group teamed up with the Washington Wine Growers Association to commission the surveys, conducted by the USDA's National Agricultural Statistics Service. See the survey results at bit.ly/acreage-survey. Apples increased their footprint (Area) for the first time in 18 years. Since 2001, apple acreage has inched downward as growers removed older trees and replaced them with high-density orchards that produced much more volume per acre. Since the previous survey in 2011, however, apple acreage jumped roughly 7 percent to 179,000 acres. Not surprisingly, Honeycrisp showed the largest jump of varieties, increasing from 9,000 acres to 23,000. Increasing density is still the story, as it has been for decades. Trees planted in 1986 or before stand at roughly 410 per acre compared with an average of roughly 1,142 for those planted in 2016. Tree density is not equal geographically either. Apple trees stand at 825 per acre in the Columbia Basin, where most of the state's newer acreage has been planted. That's compared to 571 and 690 trees per acre, respectively, in the veteran regions of Wenatchee and the Yakima Valley. Crop volumes undoubtedly will increase if the number of young trees is any indication. 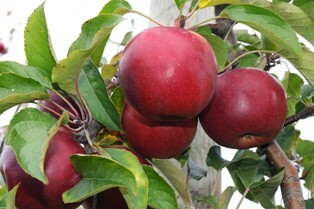 Of Washington's 126 million apple trees, almost 20% have yet to bear fruit. Of course, that won't equate to a linear 20 percent jump in production because older trees will likely be taken out to make way for some of that new production, DeVaney cautioned. To end the apple vision with a Cameo performance, why not take a Pink Lady to the Cabaret and enjoy some Jazz while performing a Sweet Tango; others will be Smitten with Envy at your Stardance!!!!!!!!!!! 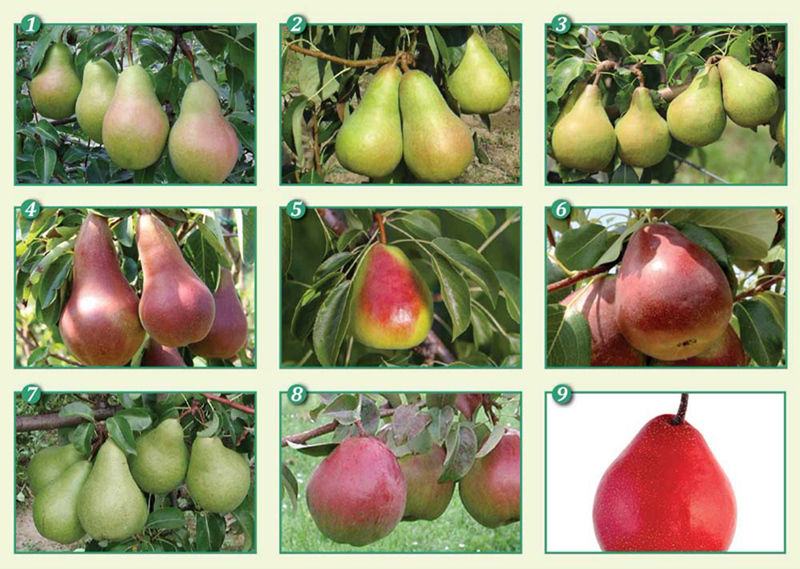 Here's a glimpse of some of the newer pear varieties discussed at Interpera, held at Wenatchee, State of Washington, USA - Wenatchee Confluence Technology Centre - June 15 -16 2017. Four Italian varieties were released by the University of Bologna in Italy, where Washington State University's Stefano Musacchi still supervises the breeding program. Early Giulia (1) is early ripening, sweet and crispy; Lucy Sweet (2) has an aromatic flavor with with both melting and juicy-crispy texture; Debby Green (3) has melting flesh, a balance of sweetness and acidity and grows on a compact tree;Lucy Red (4) has a sweet flavor with red skin, Musacchi said. Gem (5) is a U.S. Department of Agriculture variety prized as productive, nonrusseting and fire blight tolerant. It also can be eaten crispy right off the tree or ripened to a melting texture, said Todd Einhorn, Michigan State University plant physiologist. Three Belgian varieties, described by Jef Vercammen, director of a Belgian fruit growing research station: Celina/QTee (6) is a productive pear with good fruit size that is only a little susceptible to fire blight but is susceptible to frost; Cepuna/Migo (7) has good production with large fruit size, stores well and exhibits almost no russeting. Sweet Sensation (8) is a club variety that performed well on grower taste tests and good fruit set. 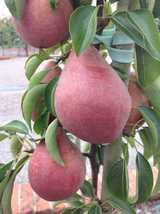 PremP009 (9), a New Zealand variety that carries the brand name Piqaboo, was discussed by breeder Lester Brewer - It's a conventional hybrid cross of European, Japanese and/or Chinese pears that rated higher in taste tests with Chinese consumers than the Asian pear Hosui. Credit: by Ross Courtney The Good Fruit Grower. Of the new pear varieties shown above: Sweet Sensation, Celina/QTee and PremP009 Piqaboo have been planted in UK orchards in recent years. It follows publication this morning of the Government's 25 year Environmental Plan. Theresa May revealed details of the long-awaited and wide-ranging 150-page strategy during a keynote speech in south-west London. Farmers manage 70% of the nation's iconic countryside and take their environmental responsibilities seriously. 10,000 football pitches worth of flower habitat, creating homes for wildlife, have been planted while more than 30,000km of hedgerows have been planted or restored by farmers. The NFU says farming is in a unique position to deliver for the environment as long as there are productive and viable businesses - where food is at the heart. 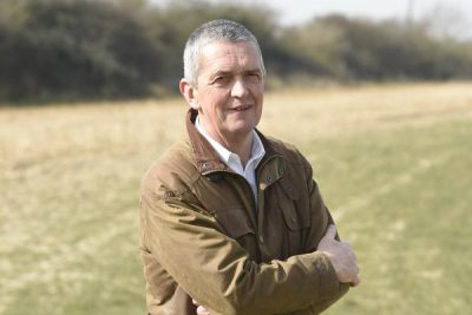 NFU Vice President Guy Smith said: "Over the past four decades, farmers have carried out a huge amount of work to encourage wildlife, as well as benefitting the landscape, soil and water and reducing their impact on the climate. "Farming also offers innovative solutions to wider environmental challenges. For instance the Government's current concern with plastics highlighted by the BBC's brilliant Blue Planet series could be met with substituting synthetic plastics with farm produced biodegradable starch-based packaging. "But there must be a coherent approach. British farming has a unique role in producing a safe, affordable and high quality supply of food as well as protecting, maintaining and enhancing 70% of the nation's iconic countryside. "That only remains feasible, however, as long as farmers run sustainable and viable businesses. We provide the raw materials for a domestic food industry that employs 3.8m people and which, as the UK's largest manufacturing sector, generates £112bn in value for the UK economy. This is why we welcomed the Secretary of State's commitment last week to create a national food policy and his recognition that food is at the heart of viable farming businesses. "It's vital therefore that a holistic approach is taken and the environment plan must go hand-in-hand with a future food policy, where measures for protecting and enhancing the environment are joined up with policies to improve productivity and manage volatility to ensure that we have profitable, productive and progressive farm businesses post-Brexit." "I`m back from my hols now and I have a had a chance to think about what I think 2018 will bring". "So, the first thing is a significant increase in value, mostly because of the shortened supply due to the cost, but also the effects of Brexit and a weaker £. A shortened supply doesn't just affect the price though, it also effects the whole dynamic of supply. The packhouses must make sure they are being efficient and maximising the product. The marketing guys are concentrating on filling orders that maximise returns rather than shifting product. For once the demand is greater than the supply and its a lot more enjoyable being a supplier. Manufacturing in Britain is a bright spot at the moment, and that is what we do basically. The other thing that I think is making us all think, is labour supply. The people who harvest our fruit are changing. They are becoming older and and less skilled. The term "students" no longer applies. There have been significant advances in robotics and when needs must, I am sure that we will all be using robots to harvest apples in the future, however, in the mean time I am sure we need to be making apple picking an easier and more pleasant experience, especially for older people. For example: We have introduced couples rooms in our accommodation - We only pay daywork now (no piecework) and have adjusted our targets to relax our expectations - We have been talking more about Pluck o Tracks Munckhoff) which eliminate the need for heavy picking buckets. I am sure there are many other things that we can do..........."
'Dear Lord: I go to work every day and put in 8 hours while my wife merely stays at home. I want her to know what I go through. So, please allow her body to switch with mine for a day. The next morning, he awoke and immediately knelt by the bed and said: - 'Lord, I don't know what I was thinking. I was so wrong to envy my wife's being able to stay home all day - Please, Oh! Oh! Please, let us trade back. This has been voted Women's Favourite joke of the Year! Sorry not a joke but reality!! !